To many it seems like the loneliest job in football - the third-choice goalkeeper who never plays. They train with the first team and travel to matches, knowing they will only play in the event of an injury crisis. Some have been in the role for the majority of their careers. Others do it in the final years before retirement. 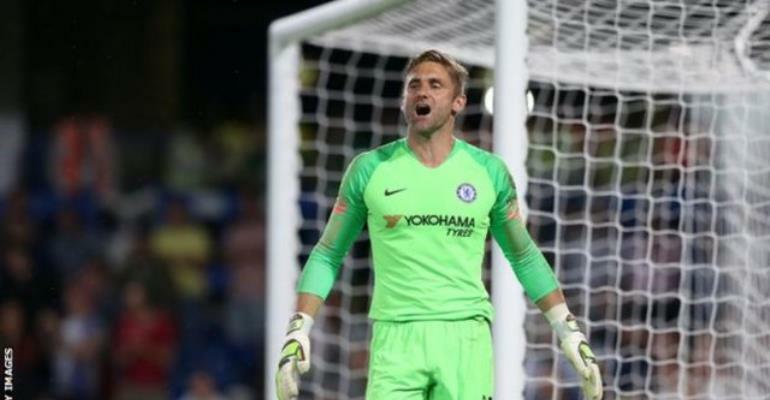 Former England goalkeeper Rob Green explains what life as a third-choice goalkeeper at a Premier League club is really like. "It is not something I ever envisaged doing when I set out - thinking 'oh yeah I'd love to be a third-choice keeper' - but your situation changes as your career goes on." Green joined Chelsea in July 2018 at the age of 38 on a one-year contract after leaving Huddersfield - where he was also third choice - at the end of the 2017-18 season. He has not played a game this campaign, with the world's most expensive goalkeeper Kepa Arrizabalaga first choice and Willy Caballero preferred when the Spaniard is absent. "My involvement hasn't been as much as I would have liked but it was made clear from the start; if everyone remains fit that is the role I have got," says Green, now 39. For Green, money was "never a factor" in his decision to join Chelsea. "You want to be paid. It is your job. It is like anyone else turning up at an office. It helps feed your family but not at one point was it a motivating factor." Green, who has previously played in the top flight for Norwich, West Ham and Queens Park Rangers, said he joined Chelsea to "experience football at the top end of the Premier League". "You look at it and think 'what excites you'," he says. "I have learnt a lot this season. "It is the first time in my career I have not looked at 40 points and thought 'thankfully we have made that'. To see how the players operate has been a real insight." Tactical work, pretending to be Saturday's opponent and keeping morale high is all part of Green's role at Chelsea. Unlike other Premier League third-choice keepers, he spent the majority of his career as a number one and started the 2010 World Cup as England's first-choice goalkeeper. Despite not playing matches he trains alongside Kepa and Caballero every day but admits things are different to when he was first choice. "There is a lot of tactical work before games so generally on a Thursday and a Friday I am more often training as the opposition than the Chelsea goalkeeper," he says. "That is a big difference. The motivation of the game on the Saturday isn't there. "Ultimately you rely on yourself to find tools to keep motivated and keep fit, rather than use external factors like the games." He adds: "The thing they don't want is having to worry about the mental state of some guy who is not going to be playing and wonder whether he is going to throw his toys out of the pram. "If you can drag people along that is more of the role than in a physical sense on the pitch. "Physically it is still tough. You are on the pitch every day. It is a seven day week. It is not like I am 21. I am 39 and out there getting peppered again. It is still a demanding role." The biggest difference is undoubtedly on a match day. Green is a part of Chelsea's 25-man Premier League squad and travels to "every game". "I go to all of the meetings, do all of the pre-match, do the warm-up and help in every way you can, whether it is collecting balls, saving shots or crossing balls in," he says. "Then, when the players are ready to come out on to the pitch, you are getting changed and more often than not at away games I find a cup of tea and go and sit in the stand." But there is no question of sitting back and relaxing. Green says watching from the stands gives him a "different perspective" to the coaches on the touchline and he will feed back into post-match analysis. "You see things that people in the dugout and players on the pitch can't see," he explains. "I have been around football a long time and know a lot about it so if I have an opinion and don't voice it then it is a bit of a waste. I may as well give an opinion while I am here." So is all that enough to make him feel part of the Chelsea team? "In a literal sense you are there as much as everyone else, but realistically no," he says. "You don't get that same motivation. There is not the same climax at the end of the week. "There is not the same commitment in a physical or mental sense. "You are disappointed when the team loses and delighted for them when they win but it is not you. It is something you are a part of but it is not you saving the shot." Overall, Green's time at Chelsea has included positives and negatives on a personal level but he says there have been other benefits that have been "incredible". "Looking back on it now, as much as anything, it has been an amazing experience for myself and also my son," he says. "Football has come into his life at the age of six or seven and it has blown his mind. For his dad to be part of it at Chelsea is incredible. "From a personal level I will probably look back on being able to take my son to Wembley and take him to Stamford Bridge to see a club like Chelsea as something that is special for me. "Whether it is a part of my career I will look back on with frustration, I don't think so. "It has given me opportunities for the future and given other people pleasure as well."